WINONA LAKE – Grace’s men’s basketball team ended a seven-game skid with a 76-67 win over Goshen on Tuesday. 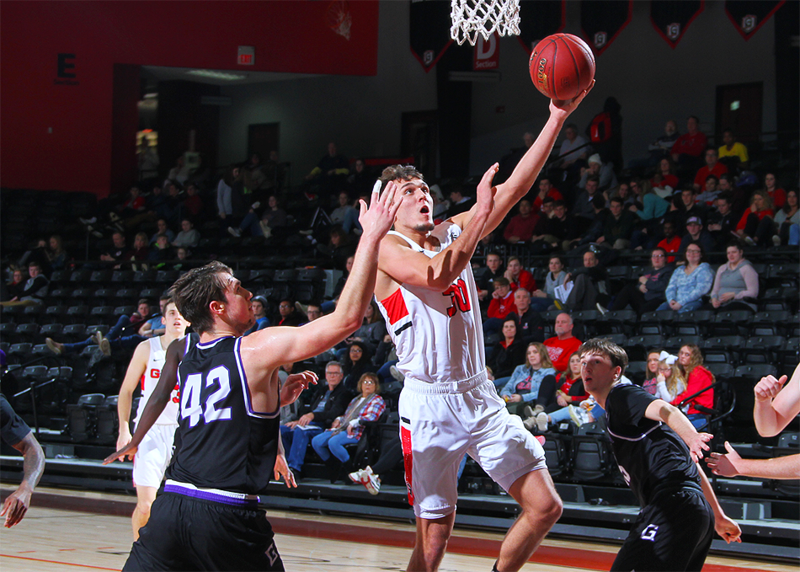 The Lancers (12-13, 2-11 Crossroads League) used a balanced scoring performance with four players reaching double figures in points. Grace won despite shooting just 2-of-14 (14 percent) from beyond the arc. But a plus-8 edge in rebounding along with just seven team turnovers helped Grace secure the season sweep of Goshen. In the first half, Grace battled its way to a lead for a majority of the 20 minutes. Back-to-back scores from Haden Deaton lifted the Lancers to a 21-14 lead after 11 minutes of play. But the Maple Leafs (6-19, 0-13 CL) rallied and eventually trimmed Grace’s lead down to two. Matters seem to worsen when Logan Godfrey was whistled for his second foul, sending the All-Conference post player to the bench. But Cody Holmes stepped up in Godfrey’s place and played several critical minutes. Holmes ripped off nine points during the final 3:17 to spark the Lancers to a 34-25 lead at halftime. Holmes made four shots and also converted an old-fashioned 3-point play during his memorable spurt. For the half, Holmes finished with 11 points and five boards on 5-of-5 shooting; his 11 points in 10 minutes beat his previous career high of eight points in a game. Grace also shot 50 percent as a team compared to 32 percent for Goshen. In the second half, Godfrey and Charlie Warner combined to score eight points in the first four minutes. Godfrey’s last bucket put the Lancers ahead 42-31, marking the largest lead of the game for either team. But the Maple Leafs repeated their effort from the first half and slowly ate away at Grace’s cushion. With just under six minutes remaining in the contest, Goshen scored to cut Grace’s lead to one at 55-54. The Lancers turned to their two most dependable scorers on the night in response. Godfrey made two free throws on the next play, and Warner buried a 3-pointer off a set play to give Grace breathing room. Goshen kept within reach, however, and only trailed by three with four minutes to play. Linville then came up with a momentum-shifting basket at that moment. With the shot clock winding down, Linville had a deep 3-pointer blocked. Linville alertly tracked down the loose ball in the corner and flipped up a shot that beat the shot clock buzzer and found the bottom of the net for a 62-57 lead. Goshen was stunned and saw the Lancers score points in the paint on the next two possessions, and Grace opened up a nine-point edge. The Maple Leafs managed to battle back to within 67-63 with a minute remaining. Godfrey gave Grace a boost with a jumper, and the Maple Leafs were forced to foul. Grace took care of the rest from the line. The Lancers made 7-of-8 on their free throws to end the game with a comfortable margin. Warner scored a team-high 23 points after shooting 9-of-14. Godfrey recorded a double-double with 20 points, 10 boards and 4 assists. Holmes had a career-high 14 points with seven rebounds, and Deaton added 11 points and four assists. Linville chipped in 4 points, 7 assists and 6 boards, and Jaret Sons tallied 10 rebounds, 5 assists and 3 steals. The Lancers will hope to continue their winning ways on Saturday. Grace plays at archrival No. 14 Bethel in a doubleheader. The men’s game will tip off at 3 p.m.